In 1958, David Magarshack and Manuel Komroff released translations of the novel, published respectively by Penguin and The New American Library of World Literature. In 1976, Ralph Matlaw thoroughly revised Garnett's work for his Norton Critical Edition volume. This in turn was the basis for Victor Terras' influential A Karamazov Companion. Another popular translation is by Julius Katzer, published by Progress Publishers in 1981 and later re-printed by Raduga Publishers Moscow. In 1990 Richard Pevear and Larissa Volokhonsky released a new translation; it won a PEN/Book-of-the-Month Club Translation Prize in 1991 and garnered positive reviews from The New York Times Book Review and the Dostoevsky scholar Joseph Frank, who praised it for being the most faithful to Dostoevsky's original Russian. In The Oxford Guide to Literature in English translations, academic Peter France writes in the section for Dostoevsky on Constance Garnett's translations: "[her] translations read easily...the basic meaning of the Russian text is accurately rendered on the whole. It is true, as critics such as Nikoliukin have demonstrated, that she shortens and simplifies, muting Dostoevsky's jarring contrasts, sacrificing his insistent rhythms and repetitions, toning down the Russian colouring, explaining and normalizing in all kinds of ways....Garnett shortens some of Dostoevsky's idiosyncrasy in order to produce an acceptable English text, but her versions were in many cases pioneering versions; decorous they may be, but they allowed this strange new voice to invade English literature and thus made it possible for later translators to go further in the search for more authentic voice." France goes on to comment on the other translations in the market. On David Magarshack's Dostoevsky translations he says: "it is not certain that Magarshack has worn as well as Garnett. He certainly corrects some of her errors; he also aims for a more up-to-date style which flows more easily in English....Being even more thoroughly englished than Garnett's, Magarshack's translations lack some of the excitement of the foreign." On MacAndrew's American version, he writes: "He translates fairly freely, altering details, rearranging, shortening and explaining the Russian to produce texts which lack a distinctive voice." On David McDuff's Penguin translation he continues: "McDuff carries this literalism the furthest of any of the translators. In his Brothers Karamazov the odd, fussy tone of the narrator is well rendered in the preface....At times, indeed, the convoluted style might make the reader unfamiliar with Dostoevsky's Russian question the translator's command of English. More seriously, this literalism means that the dialogue is sometimes impossibly odd—and as a result rather dead....Such 'foreignizing' fidelity makes for difficult reading." 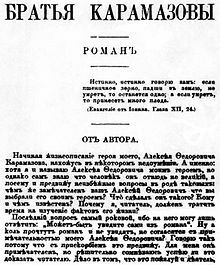 On the Pevear and Volokhonsky's translation, France writes: "Pevear and Volokhonsky, while they too stress the need to exhume the real, rough-edged Dostoevsky from the normalization practised by earlier translators, generally offers a rather more satisfactory compromise between the literal and the readable. In particular, their rendering of dialogue is often livelier and more colloquial than McDuff's.... Elsewhere, it has to be said, the desire to replicate the vocabulary or syntax of the Russian results in unnecessary awkwardness and obscurity." In commenting on Ignat Avsey's translation, he writes: "His not entirely unprecedented choice of a more natural-sounding English formulation is symptomatic of his general desire to make his text English....His is an enjoyable version in the domesticating tradition." The Brothers Karamazov has had a deep influence on many writers, philosophers, and public figures over the years. Admirers of the novel include Albert Einstein, Sigmund Freud, Ludwig Wittgenstein, Martin Heidegger, Cormac McCarthy, Kurt Vonnegut, Haruki Murakami, and Frederick Buechner. Laura Bush, C. P. Snow, writing about Einstein's admiration of the novel, wrote, "The Brothers Karamazov—that for him in 1919 was the supreme summit of all literature. It remained so when I talked to him in 1937, and probably until the end of his life." Sigmund Freud called it "the most magnificent novel ever written" and was fascinated with the book for its Oedipal themes. In 1928 Freud published a paper titled "Dostoevsky and Parricide" in which he investigated Dostoevsky's own neuroses. Freud claimed that Dostoevsky's epilepsy was not a natural condition but instead a physical manifestation of the author's hidden guilt over his father's death. According to Freud, Dostoevsky (and all other sons) wished for the death of his father because of latent desire for his mother; and as evidence Freud cites the fact that Dostoevsky's epileptic fits did not begin until he turned 18, the year his father died. The themes of patricide and guilt, especially in the form of moral guilt illustrated by Ivan Karamazov, would then obviously follow for Freud as literary evidence of this theory. Franz Kafka is another writer who felt immensely indebted to Dostoevsky and The Brothers Karamazov for influencing his own work. Kafka called himself and Dostoevsky "blood relatives", perhaps because of Dostoevsky's existential motifs. Another interesting parallel between the two authors was their strained relationships with their fathers. Kafka felt immensely drawn to the hatred Fyodor's sons demonstrate toward their father in The Brothers Karamazov and dealt with the theme of fathers and sons himself in many of his works, most explicitly in his short story "The Judgment". The existentialist philosopher and Nobel Prize-winning author Albert Camus centered on a discussion of Ivan Karamazov's revolt in his 1951 book Rebel. According to the philosopher Charles B. Guignon, the novel's most fascinating character, Ivan Karamazov, had by the middle of the twentieth century become the icon of existentialist rebellion in the writings of Albert Camus and Jean-Paul Sartre. An important part of the novel is the poem The Grand Inquisitor, told by Ivan, which is one of the best-known passages in modern literature because of its ideas about human nature, freedom, power, authority, and religion, and for its fundamental ambiguity. A reference to the poem can be found in Aldous Huxley's novel Brave New World Revisited and David Foster Wallace's novel Infinite Jest. Joseph Stalin had read Dostoevsky since his youth and considered the author as a great psychologist. His copy of The Brothers Karamazov reveals extensive highlights and notes in the margins that he made while reading the work, which have been studied and analyzed by multiple researchers. The President of the Russian Federation Vladimir Putin has described The Brothers Karamazov as one of his favorite books. According to Serbian state news agency Tanjug, Serbian president Aleksandar Vučić described Fyodor Dostoevsky as his dearest novelist. He also said that "The Brothers Karamazov may be the best work of world literature". The philosopher Ludwig Wittgenstein is said to have read The Brothers Karamazov "so often he knew whole passages of it by heart.” A copy of the novel was one of the few possessions Wittgenstein brought with him to the front during World War I. Martin Heidegger, the seminal figure of existentialism, identified Dostoevsky's thought as one of the most important sources for his early and best known book, Being and Time. Of the two portraits Heidegger kept on the wall of his office, one was of Dostoevsky. In an essay on the novel written after the Russian Revolution and the First World War, Nobel Prize-winning author Hermann Hesse described Dostoevsky as not a "poet" but a "prophet". The acclaimed novelist W. Somerset Maugham included The Brothers Karamazov in his list of ten greatest novels in the world. Pope Benedict XVI cited this book in the 2007 encyclical Spe Salvi. The Japanese drama Karamazov no Kyodai (2013, created by Misato Sato) is a modern retelling of the book. ^ Freud, S. (1945-01-01). "Dostoevsky and parricide". The International Journal of Psycho-Analysis. 26: 1–8. ISSN 0020-7578. PMID 21006519. ^ Anderson, Sam (2011-10-21). "The Fierce Imagination of Haruki Murakami". The New York Times. ISSN 0362-4331. Retrieved 2016-08-24. ^ "The Former First Lady As A Literary Device". The New Yorker. 2009-10-16. Retrieved 2016-08-24. ^ a b Dostoyevsky, Fyodor; Guignon, Charles B. (1993). The Grand Inquisitor: With Related Chapters from The Brothers Karamazov. Hackett Publishing. ISBN 0872201937. ^ "Stalin's Brothers Karamazov - Hungarian Review". www.hungarianreview.com. Retrieved 2016-08-24. ^ Brinkley, Tony; Kostova, Raina (2006-01-01). "Dialogic Imaginings: Stalin's Re-Reading in the 1930s of the Brothers Karamazov". The Dostoevsky Journal. 7 (1): 55–74. doi:10.1163/23752122-00701003. ISSN 2375-2122. 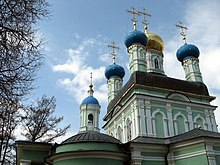 ^ Bezrukov, Artem. "Vladimir Putin's 9 favorite books". favobooks.com. Retrieved 2016-08-24. ^ "Heidegger, Martin: Frühe Schriften – Vittorio Klostermann – Philosophie, Recht, Literatur, Bibliothek". www.klostermann.de. Retrieved 2016-08-24. ^ a b dumsumdumfai (3 September 2013). "The Brothers Karamazov (TV Mini-Series 2013)". IMDb. ^ "karamaazofu no kyoudai – MyDramaList". Mydramalist.info. Retrieved 15 March 2013.